"Loving the Double Wide" is an eBook with lessons and layouts from Kim Watson, Lynn Grieveson, Emily Pitts, Amber Ries, and Shelly Jaquet. There are also recorded video interviews and office hours sessions with each of the teachers. AND 5 layered templates. Scrapbook Coach "Double Wide" is 4 video lessons walking through making 4 2-pageres. And there are 4 layered templates to go with the lessons. 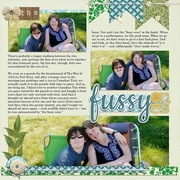 I LOVE the pages I made for the Scrapbook Coach class -- all very different from my usual two-pagers. I'm also doing a bunch of these monthly roundups -- not real elegant but a great place for the photos that don't get a whole page (and I include highlights that also got their own page).